How do you take in life? American landscape photographer Ansel Adams grew up in San Francisco and fell in love with nature very early on. Producing beautiful images of the American West, especially Yosemite National Park, he was acclaimed for his attention to the transitory quality of light in each scene. His goal was to reveal the beauty to others not necessarily how the subject appeared in reality but how it felt to him. He created many images of the Sierra Nevada always finding new aspects to capture perceiving “the delicate and persuasive complex of nature.” Like Ansel, explore each experience. Slow down right where you are and take it all in. These moments will never come again. Tune into every aspect of the Present. Absorb the beauty of your surroundings. If it seems ordinary at first, go a little deeper. Notice how it makes you feel. Pay attention to the people around you as if they were simply parts of the Living Universe (as they really are) without any judgments. Keep your eyes open for new discoveries about yourself. Be on the lookout for insights you can gain from each situation. How you approach life determines the richness of your journey. 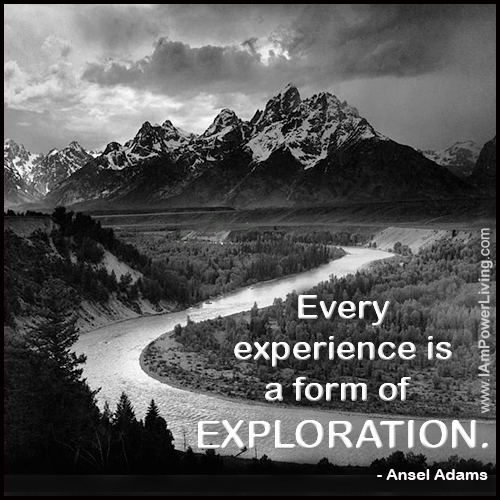 Every day seek to explore like a wonder-filled adventurer. A Dose of Power Living #188. Published 10/07/18. Writing and quote card design by Teresa Kay-Aba Kennedy. Image courtesy of National Parks Service / Public Domain. See all Dose features.